Bumble B. Rumble is the boss level of the Vine Valley, the third world of the game Donkey Kong Country. The Kongs must beat the giant Zinger Queen B. to progress to Gorilla Glacier. As with all world boss fights in Donkey Kong Country, the fight takes place in an arena filled with bananas; and if the player enters with a single Kong, a DK Barrel is instantly broken to ensure they start the fight with both Donkey and Diddy. Two points with regenerating barrels exist, left and right of the arena's center (only one regenerating barrel exists in the center in the Game Boy Color version). Queen B. begins by flying anti-clockwise around the level area. As with the smaller zingers, if a Kong comes into direct contact with her, they will take damage and either run away or lose a life, depending on whether they still have their partner. If she is hit with a barrel, she will turn red and move in a vertical wave from the top to the bottom of the screen, in the direction she is facing, turning only at the edges of the arena. During this phase, Queen B. is invulnerable and the Kongs simply have to avoid her until she reverts to yellow. Once she has returned to normal - depending on where she was on the screen and the direction she was facing, this may reverse her circumnavigation - she will move slightly faster, and the Kongs must repeat the process. After five Barrel hits, Queen B. is defeated and the Kongs recover a Giant Banana. 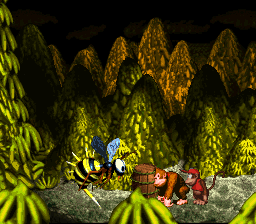 In the Game Boy Advance port of Donkey Kong Country, Queen B., while red, is protected by normal Zingers. These Zingers must be destroyed before Queen B. can be attacked again. Also, she always moves in a wavy motion, regardless of her coloration and vulnerability, though she only homes into the Kongs while yellow. Her arena has only one barrel at a time, which falls from above in a random location, unlike the two respawning barrels in the original version. This page was last edited on April 12, 2019, at 03:59.